We post copious resources for the study of philosophy on this site, such that you can obtain a full college-level survey understanding of the subject on your own by taking the many free classes, listening to the many free lectures and podcasts, and reading the many free texts, ebooks and commentaries you’ll find here. But several of our posts have met with a similar reader objection: where is the Eastern philosophy? The question could also be put to almost any academic department of philosophy. One answer I’ve often heard dismisses it altogether. Philosophy, some say, developed in the West, first in ancient Greece, then in Rome, the succeeding Christian empire, and the secular age that followed. It is a European pursuit and tradition. Other culturally partial critics, who wish to appear enlightened, are willing to concede that “the world’s Muslims,” as Richard Dawkins tweeted a few years back, “did great things in the Middle Ages,” at least providing a critical bridge between the fall of the Roman Empire and the rise of Scholasticism. 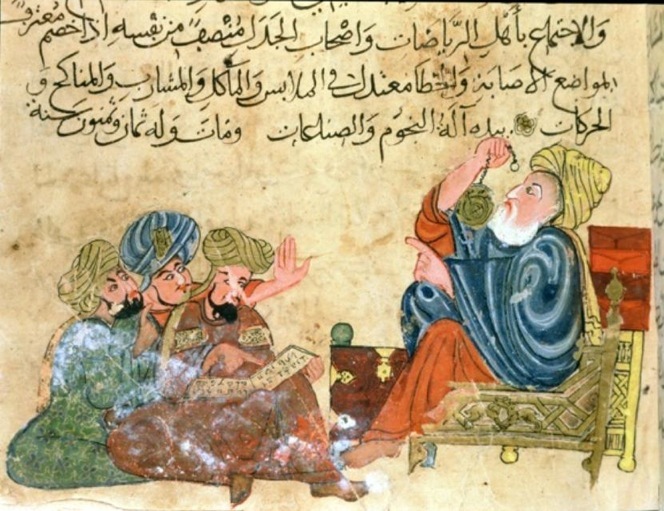 Islamic philosophers like Avicenna and Averroes kept in dialogue with the Greeks after Europe had forgotten them, and preserved the only work of Aristotle we have. But that was then. What have they done for us lately? Attitudes like this, argues philosophy professor Peter Adamson, are prejudices with little basis in fact, and part of the reason for a dearth of high-quality, accessible Eastern philosophy resources in English. Adamson, who has made significant contributions to the study of philosophy online with his podcast, History of Philosophy Without Any Gaps, fills in the gap with his series on Islamic and Indian philosophy in several parts. Beginning with philosophy in the Islamic world in Episode 171, “Eastern Traditions,” at the top, Adamson covers “influential thinkers of the twelfth century like Fakhr al-Dīn al-Rāzī and Suhrawardī, focusing on their legacy in the Eastern realms of central Asia and Persia, moving on to the Ottoman, Safavid and Mughal empires, and ending with developments in twentieth century philosophy.” Against dismissive claims like Dawkins’ that these centuries were “a time of intellectual and scientific decline in Islamic civilization,” Adamson argues they were “in fact a time of remarkable achievement in fields like logic and astronomy as well as the various disciplines of philosophy.” See all three parts of the Islamic Philosophy series above. Many of these guidelines rub up against the current orthodoxies, assumptions and, frankly, snobberies of some contemporary academic philosophy. Among these, “Rule 14: Take religion seriously” and “Rule 15: Be broadminded about what counts as ‘philosophy.’” And for those who not only dismiss but also embrace entire cultures’ philosophical traditions for one defining reason—Indian thought is “spiritual” or “non-violent”; Islamic thought is “tolerant” or “intolerant”—Adamson offers Rule 18: “don’t essentialize.” As becomes clear on even a cursory listen to the podcasts in these series, what we tend to believe about “non-western” philosophy operates far in excess of what most of us actually know about it. This entry was posted on 28 February, 2018 in homepage. Bookmark the permalink.